Aizawl, Nov 25 : All is set for the elections to the Mizoram Assembly to be held on Monday. The polling officials have all been dispatched to their locations and some are on the way in the remote areas, Chief Election Office sources said. 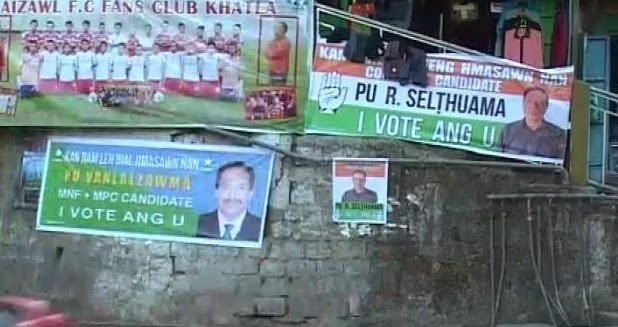 The Mizoram poll campaign could be certified as being the most orderly as candidates and parties stuck to the no littering, no random postering rule while keeping the public campaigns as quiet as possible. Rallies or processions where held within the constituencies by the candidates under the strict watch of the poll watchdog, the Mizoram People’s Forum (MPF). However, on the expenditure front, it will take trained sleuths to find out how much money floated around during these campaigns, particularly in the interior. For the first time in India, Voter Verifiable Paper Audit Trail (VVPAT) will be put into action. Election officials said that this would go a long way in deflecting charges that Electronic Voter Machines (EVMs) can be manipulated. The VVPATs will be used in only 10 constituencies as the manufacturers could not supply the requirement on time. After a severe hiccup during the mandatory mock poll drill to check the Electronic Voting Machines (EVMs) to be used in Serchhip district, the district poll officials has given it the thumbs up recently after a second trial. The 142 candidates in the poll include only six women in the only State of the country where the number of women voters outnumber the men. Only one of these women, Lalmalsawmi of the Mizo National Front (MNF) has a fighting chance of winning, but she is pitched against the Home Minister R Lalzirliana, who has proved to be a no holds barred campaigner. The other woman who may give her rivals a run for their money is B Sangkhumi, a former president of the Mizoram Hmeichhe Insuihkhawm Pawl (MHIP), a powerful women’s organisation. She was promised the MNF party ticket but was dropped at the last moment. Taking a bold step, she set herself up as an independent candidate which is a rare and strong statement of defiance in this State where submission to the high and the mighty is the norm. After the voting on Monday, the EVMs will be put in strong rooms in all the district headquarters and be opened only on December 9 to be counted.